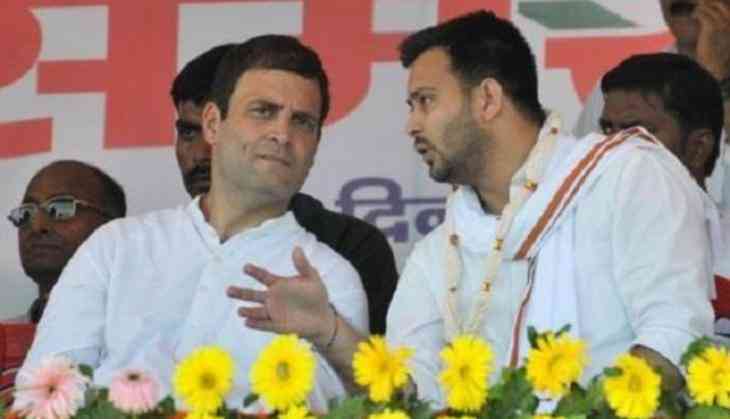 Ahead of the Lok Sabha polls, the much awaited poll pact in Bihar of the ‘Mahagathbandhan’ has announced their seat sharing deal and the Rashtriya Janta Dal will be contesting upon 20 seats and the Congress has got 9 seats. Bihar holds 40 seats in its pocket and the other ally members HAM 3 and RLSP has received 5 seats respectively. Sharad Yadav’s party will be contesting from the RJD’s ticket. HAM's Jitanram Manjhi will be contesting from the Gaya seat. Another ally partner VIP has also received 3 seats to contest in the polls for 2019. Although, RJD leader Tejashwi Yadav did not attend the press breifing to announce the seat-sharing deal. Manoj Jah, leader of RJD, while announcing the pact stated, "RJD on 20, Congress on 9, HAM-3, RLSP on 5, BIP on 3 and CPI-1 in RJD quota."